"Helping you make DIY magic." WhisperWood Cottage earned its name from the natural wooded environment surrounding it. Since it's too cold to be outside, I thought I'd bring some outdoors in! 1. 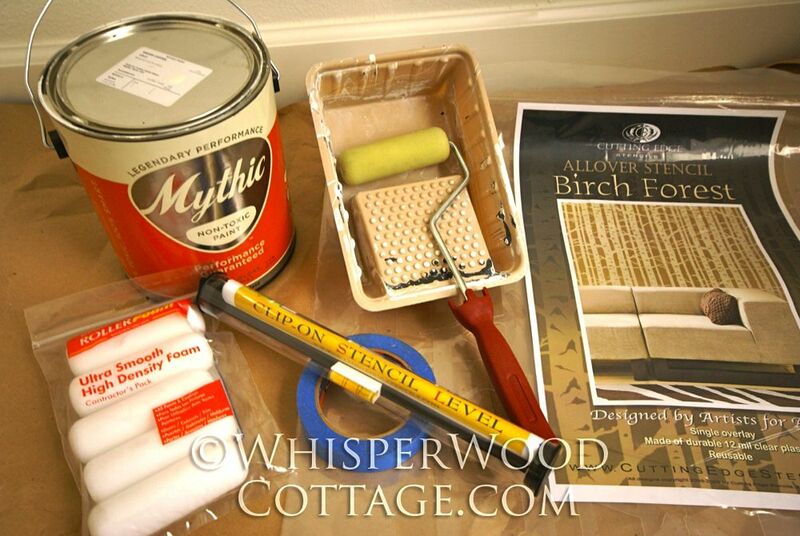 I started by touching up the walls with my custom color from Mythic Paint and Purdy paint brush. The custom color was ordered to match the existing wall color that I have throughout many rooms in the cottage. 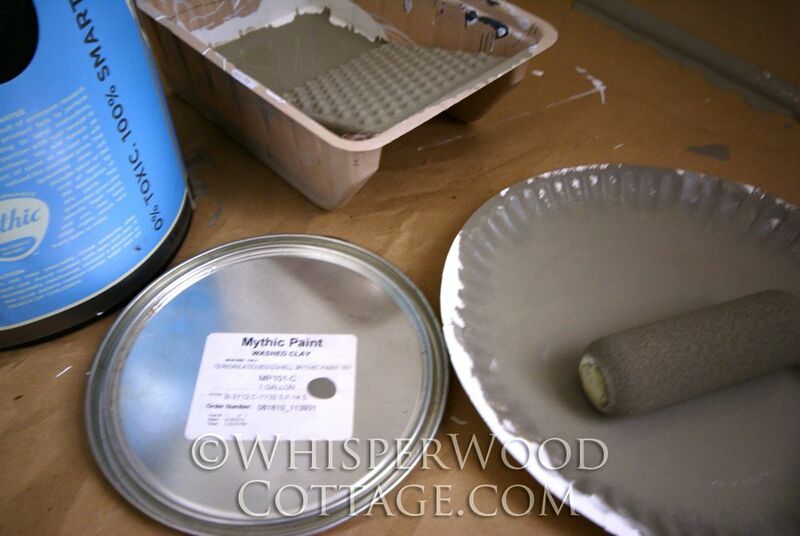 What I like about working with Mythic Paint is that winter painting indoors is a breeze without the paint fumes that would normally wreak havoc on my senses! 2. 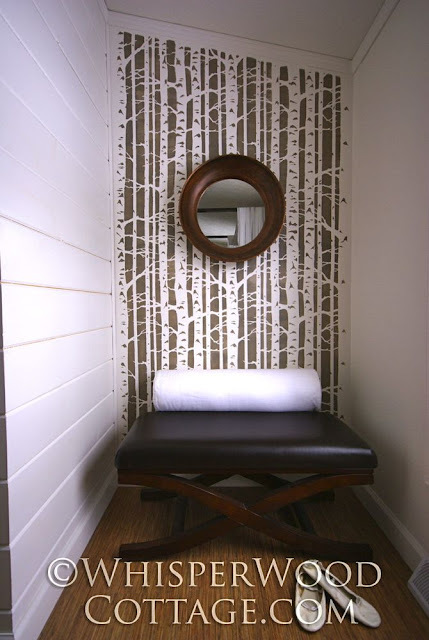 I placed the stencil level on top of the stencil and placed it on the wall staring in the bottom right corner. While it normally recommended that you start at the top of the wall, I thought I best to start at the bottom due to the angle of the ceiling. Using the painter's tape, I did my best to get it in a fixed position. 3. I poured the Washed Clay color from Mythic Paint into the paint tray. I filled the 4" foam roller with paint and rolled it onto a stack of 4-5 paper plates so that it was wet but not dripping with paint. This prevents it from bleeding under the stencil. I rolled the paint onto the stencil. Magic! 4. 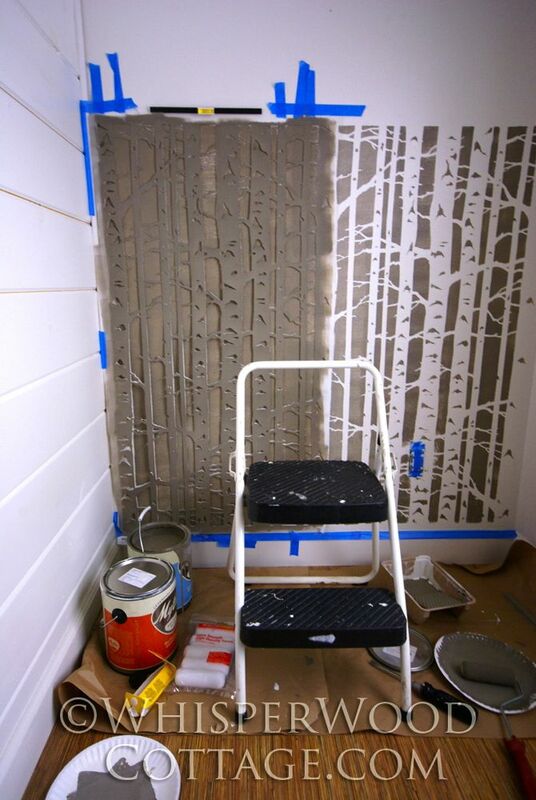 I repeated the process 3 additional times to cover the entire wall space in this nook. 5. 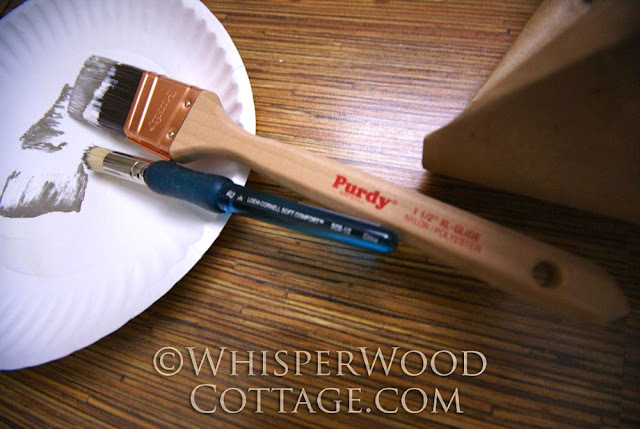 I used my Purdy paint brush to touch up the paint that I inadvertently rolled onto the ceiling and my 1/2" stencil brush to blend some of the seams between the bottom and top layers of the stencil. Then I stepped back and took a look at my handiwork. Tada! It had a much bigger impact than I though it would! oh my gosh.. can i move into your nook, amy? i love it!!!! it's PERFECT! Oh my, I love it! Great choice going with the round mirror, it really emphizes the vertical lines. Great job! How pretty! You did a fantastic job! Love it!! Amy that looks fantastic! Really give that area some personality. You did such a good job. The big round mirror is great too. Really love it Amy, What a great stencil and the color is great too! Looks really great. What a daring approach but it totally rocks! I really love the look of that!! Oh my gosh!! It is gorgeous!! I love it!!!! That stencil is awesome and I love the color! Well done! 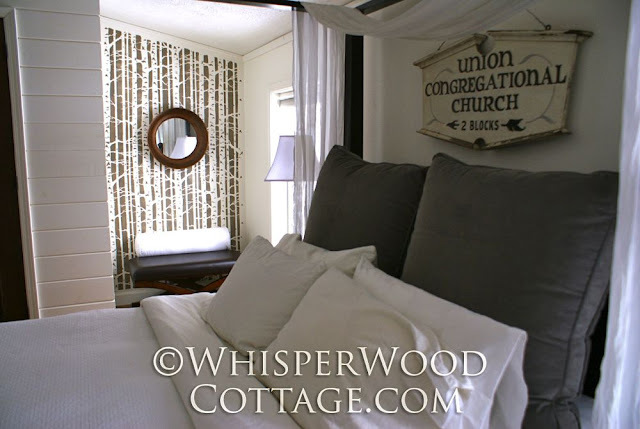 Love the connection between the nook and the sign above your bed pointing the way...kinda like a little church in the wildwoods. So..... you're coming to my house with that whole kit... when?! THAT IS FANTASTIC!!! such a great little surprise you created in that corner - love the texture of it - great job amy! 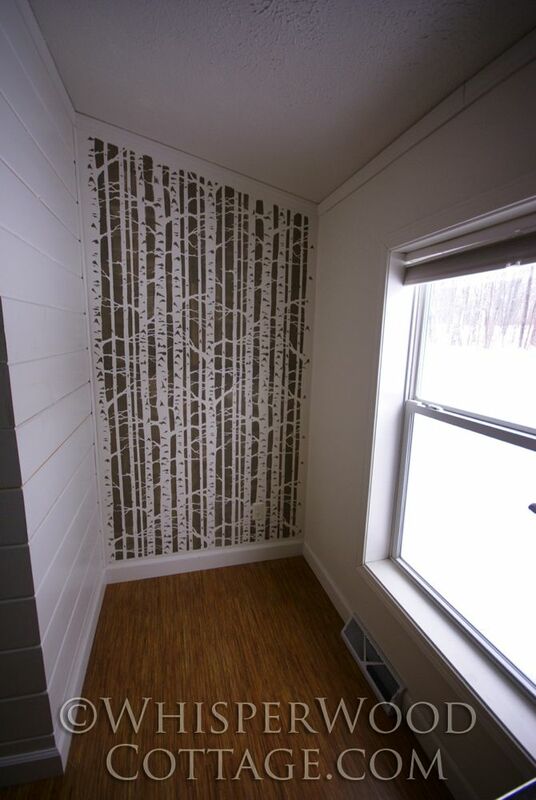 I LOVE the birch stencil so much!! It looks so awesome!! So cool! I love how that little niche pops out at you now....awesome job girl! Wow, Amy! What a cool corner! I love that it's an unexpected surprise waiting over there for you to glimpse when you come in the room! Looks amazing! Wow! This is great! What a nice little retreat. Thanks for sharing. That is perfect! love it! So pretty and beautifully done! I love this more every time I see it! I'm putting it in the PoPP Spotlight. I just love your home, Amy and your nook is no exception. Simply beautiful. Thanks so much for sharing. 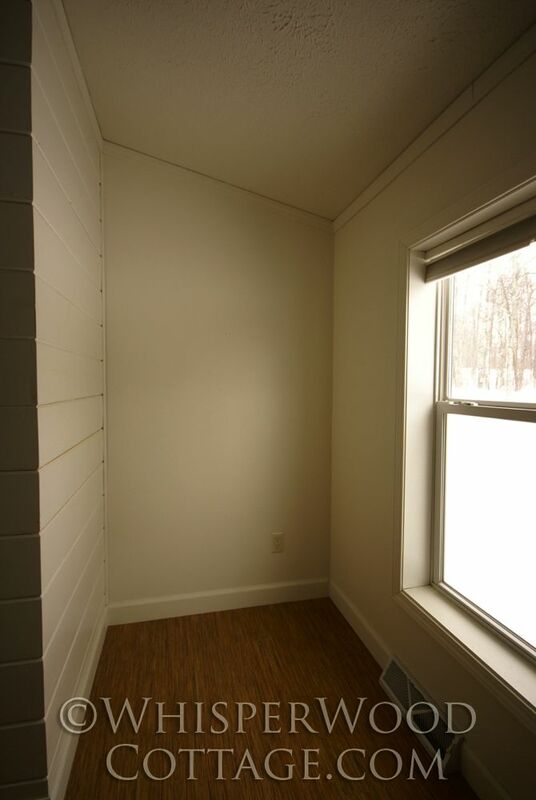 What a wonderful addition to your room....so classy looking! 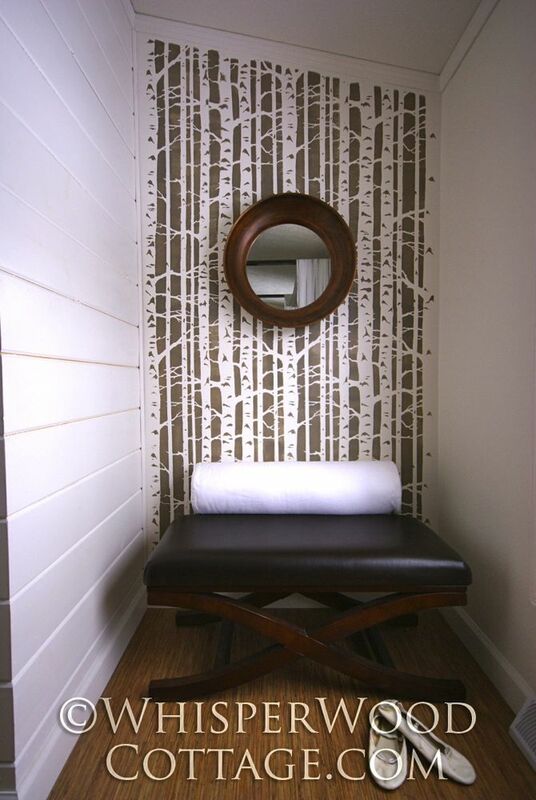 I love how you transformed your cute little nook into a birch forest. This is amazingly gorgeous!!! I love it!! It looks fabulous. I'm your newest follower. 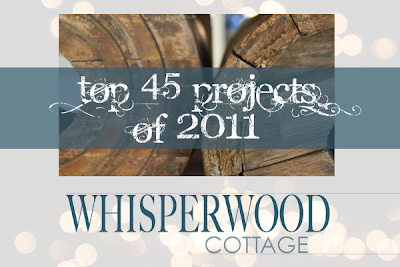 I'm throwing my first link party today (Monday) it would be great if you would stop by and share your project. That looks sensational. I adore the colors and the motif. Perfect for the room and exactly right for me as an embellishment. Love it! oh wow! This is so beautiful. I have wanted a wall of birch trees and thought about hand painting but this looks so much easier! Thanks for the inspiration and the tips!